The definition of success varies from different individuals. It has been a generational pattern, passed on from parent to child on how we want our lives to be when we get there. We inherit these traits, behavior and way of thinking from our life mentors, in our early stages. In most cases, that would be our parents. 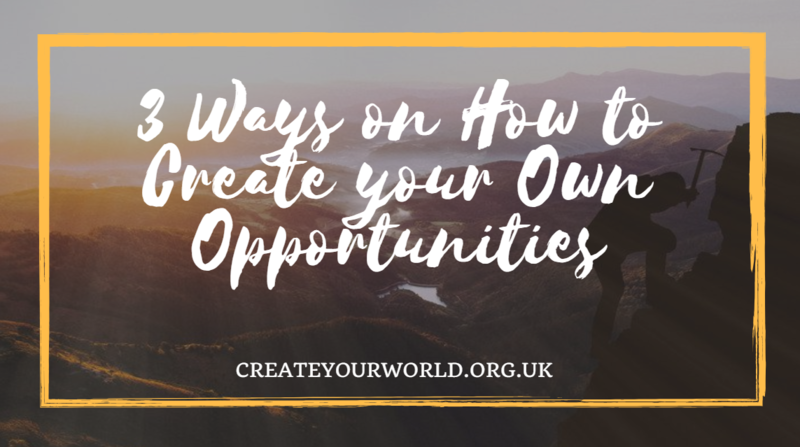 How do we identify opportunities when it happens? Or it’s just a frame of mind that we need to reprogram to help us easily create our own opportunities in life. Building your own doors of opportunities and knocking on them is the sure way to go when it comes to great success. It is definitely easier said than done. Making things happen instead of waiting things to happen, would be a wonderful start. – Being aware of where we are in life, makes us know how to begin our journey to success. – Accepting the facts and truths about our situation, keeps us grounded to ourselves. – Understanding that everyone starts from this path, and it’s just a part of the process, to help us to where we need to be. – We often ask ourselves several questions every day or even more. The reasons of the things that we need to do in our existence. – It is our inner voice that guides us to success and even failures. We are in constant communication with ourselves. – True intentions speaks from our soul. Our guiding light to all actions. – Whatever we focus on, expands. Are we focusing on the things we want or we don’t want? Success or Failures? Obstacles or Opportunities? – It’s simply where we spend most of our energies for that creates our line of emotions and actions that comes to a result. – Always be mindful of where your mind is focusing on. Take control! One great strategy is to be better managers of our own State and Powerhouse. The way to create more opportunities in life is to play full out, be flexible, take responsibilities, have fun and keep growing and contributing. Our participation in our own lives creates value to ourselves and others. If you like this article, please do share us and write your comments below and also sign up for more Stress Busters!